A research team has identified a pair of blood biomarkers that could someday allow physicians to detect pancreatic cancer in humans before it reaches advanced stages. 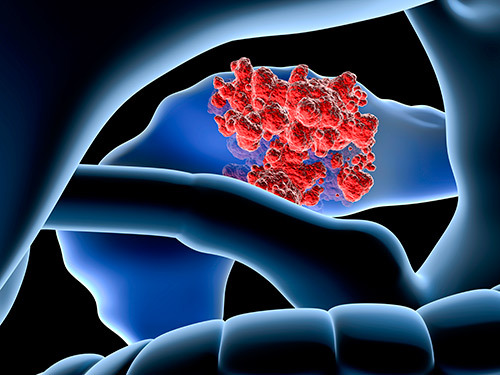 The biomarkers correctly detected pancreatic cancer in blood samples collected from patients at different stages of their disease, according to results published in Science Translational Medicine. Ken Zaret, PhD, director of the Penn Institute for Regenerative Medicine, and Gloria Petersen, Ph.D., director of the biospecimen resource program for pancreas research at the Mayo Clinic, led the research team that identified the biomarker panel. The panel was enabled by discovery work of first author Jungsun Kim, Ph.D., a postdoctoral fellow in Dr. Zaret’s lab, and builds on a first-of-its-kind human-cell model of pancreatic cancer progression described by Dr. Zaret’s lab in 2013. Using stem-cell technology, the researchers created a cell line from a patient with advanced pancreatic ductal adenocarcinoma (PDAC). Genetically reprogramming late-stage human cancer cells to a stem-cell state enabled the researchers to force the reprogrammed cells to advance to an early cancerous state, revealing secreted blood biomarkers of early-stage disease. The best candidate biomarker, plasma thrombospondin-2 (THBS2), was screened against 746 cancer and control plasma samples using a commercially available protein-detection assay described as inexpensive. The researchers found that blood levels of THBS2, when combined with levels of a known later-stage biomarker called CA19-9, could reliably detect pancreatic cancer in patients. Researchers refined the assay with independent investigations of plasma samples from patients with different stages of cancer, from individuals with benign pancreatic disease, and from healthy controls. All were obtained from Dr. Petersen. The combination biomarker panel also improved the ability of researchers to distinguish cases of cancer from pancreatitis. The panel will next be validated in a set of samples from pancreatic cancer patients who provided a research blood sample before being diagnosed with the disease. Joining Drs. Zaret and Petersen as co-authors were Greg Donahue, Xing-Jun Cao, and Benjamin A. Garcia, all of Penn; and Suresh Chari, William R. Bamlet, Ann L. Oberg, and Kari G. Chaffee, all of the Mayo Clinic. Funding for the researchers came in part from the NIH’s National Institute for General Medical Science (R37GM36477, P30DK050306, U01CA210138, P30DK19525), the U.S. Department of Defense (BC123187P1), and the Pancreatic Cancer Translational Center of Excellence at Penn’s Abramson Cancer Center.